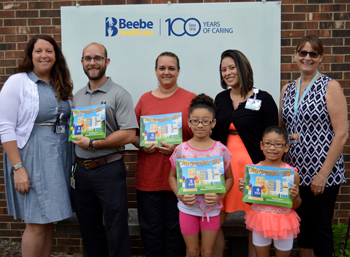 As part of the 100th anniversary celebrations, Beebe Healthcare has published a heart-warming, children’s illustrated book entitled Beebe’s Big Birthday. The book is available in both English and Spanish. 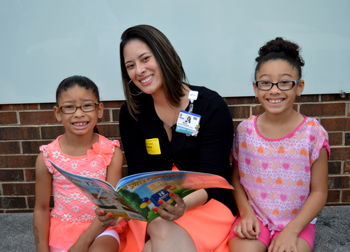 To debut the Spanish version of the book, Beebe Healthcare Pre-Arrivals Registration team member, Mara Perez-Irizarry, read to English Language Learners at H.O. Brittingham Elementary School in Milton on Tuesday, June 7. About 15 students, who are native Spanish speakers, enjoyed the first public reading of the book. Each student received a copy of the children’s book to share with their families. “It was so wonderful to see a group of children get to enjoy this book being read in their first language, and by a valued Beebe employee who is bilingual. The story shared so many valuable lessons about trade, healthcare, volunteerism and history, in a way which can be easily understood by children of all ages. Our hope is that the community at-large will share and enjoy these books for years to come in honor of all the men and women who care for our community at Beebe every day,” said Leanne Prosser, 100th Anniversary Coordinator at Beebe Healthcare. Beebe’s Big Birthday is told through the eyes of Anna Beebe Moore, daughter of co-founding brother Dr. Richard. C. Beebe and niece of co-founding brother Dr. James Beebe, Sr. Her smiling face appears in the beginning and in the end as she recounts in poetic fashion how the hospital came to be, and how different everything is today from what it was in 1916. The illustrations are bold and colorful, and based on authentic historic photographs, as well as those from modern day. Anna Beebe Moore, who lives locally, took an active role in the creation of the book, which was published by Mainstay Publishing, in coordination with a dedicated team of volunteers from Beebe and the community. It was translated into Spanish by Hook Associates. Beebe’s Big Birthday not only tells the story of how the two brothers founded the hospital in 1916, but also introduces young readers to Beebe team members who open their hearts to patients and their families. The Children’s Book Committee consisted of Alison Myers, project Leader, Stephan Betins-Kinnamon, Chanta Howard-Wilkinson, Edilu Nehrbas, and Jeanne Smith. “Beebe’s Big Birthday” in either English or Spanish is available for purchase for $10 online at www.beebestore.com. It also is sold in the Delaware Beaches area at the following locations: Beebe’s gift shop at Beebe Healthcare in Lewes; The Lewes Historical Society gift shop; Kids’ Ketch toy store on 2nd Street in Lewes; Browsabout book store on Rehoboth Avenue in Rehoboth Beach; and Bethany Books on Garfield Parkway in Bethany Beach. About 15 H.O. Brittingham students enjoyed the first public reading of the Spanish version of “Beebe’s Big Birthday,” a children’s book commemorating Beebe’s 100th Anniversary. Shown (left to right) are Leanne Prosser, Beebe Healthcare’s 100th Anniversary Coordinator; Brennan Clarke, who teaches English Language Learners at H.O. Brittingham; Kim Shiels, who teaches English Language Learners at H.O. Brittingham; Mara Perez-Irizarry, Beebe Healthcare team member and her two children, Miley Rivera-Perez and Mara Rivera-Perez; and Trish Mumford, Principal of H.O. Brittingham. Shown are Mara Perez-Irizarry with her daughters, Mara and Miley, who attend H.O. Brittingham Elementary in Milton.